Alter The Press! : Album Review: Cuba Cuba - Where Else Is Safe But The Road? 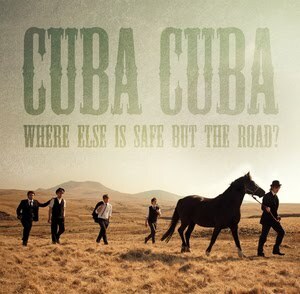 Album Review: Cuba Cuba - Where Else Is Safe But The Road? There’s something in the water over at Walnut Tree Records, it seems that every release they bring out recently is absolutely outstanding, and now it’s the turn of South Wales’ own Cuba Cuba to keep up that momentum. Things get started with “Building Blocks” a nice enough opener that leads into quite possibly the stand out track of the album “Fifty A Night” a song that has a hook so brilliant you’ll have it in your head for days while “Outlines” does the complete opposite and hits you with a barrage of noise that’ll leave you feeling as if you’ve received an assault on your senses, in a good way of course. Things show no signs of letting up either, “Golden Grounds” is absolutely huge, it could easily be a single, and a successful one at that, it really is great, however as with all albums, there’s going to be a song that you don’t quite get along with, and that one for me is “Hong Kong”, a song that relies too much on effects and unfortunately lacks a bit in structure. Thankfully it’s the only sour point in an otherwise great album because things pick back up again with “Home Is The Fire” a song that builds up beautifully showing a stark contrast to the song before it. As we go into the final run in of the album you get hit with a song with brilliance written all over it: “Pride Rock”. a song that initially starts off almost like a sample from the Lion King carries on and turns into a song filled with poignancy and a key change so fitting that for me at least gave me chills of sheer happiness. The album ends with the brooding “Away Part 2” a song that features vocals from Tiger Please’s Leon Stanford, another contender for song of the album, it’s a song that is entirely different from the rest of the album in terms of tone but it’s one that’s an effective closer that gives you time to reflect on the album to the most suitable of soundtracks..
'Where Else Is Safe But The Road?' by Cuba Cuba is released on June 27th through Walnut Tree Records.